Jamie Leary エピソード："The Tale of Station 109.1"
Greg Banks エピソード："Say Cheese and Die"
Sean エピソード："The Case of the Burning Building"
Matt Kalinsky エピソード： "I Do, I Don't"
Saturday Night Live 本人役、ホスト エピソード："Ryan Gosling / Leon Bridges"
"You Always Hurt the Ones You Love"
Nick Johnstone (2013). Ryan Gosling: Hollywood's Finest. John Blake Publishing. ISBN 978-1-78219-460-6. ^ 原文："I had a kid come up to me on the street, 10 years old, and he says, 'Are you that guy from Stay? What the f--- was that movie about?' I think that's great. I'm just as proud if someone says, 'Hey, you made me sick in that movie,' as if they say I made them cry." ^ 原文："the best experience I have ever had making a film." ^ 原文：I’ve lost perspective on what I’m doing. I think it’s good for me to take a break and reassess why I’m doing it and how I’m doing it. And I think this is probably a good way to learn about that. ^ Shone, Tom (2011年9月11日). “In the Driving Seat: Interview with Ryan Gosling”. The Daily Telegraph (London). http://www.telegraph.co.uk/culture/film/film-news/8750070/In-the-driving-seat-interview-with-Ryan-Gosling.html 2012年1月26日閲覧. "'I feel like I think like a woman, because I grew up with my mother and my sister so I've just been programmed to think like a girl,' he says." ^ GQ. (January 2011). p. 50. ^ W（英語版）. (October 2010). p. 89. ^ a b Lim, Dennis (2011年9月14日). “A Heartthrob Finds His Tough-Guy Side”. The New York Times. 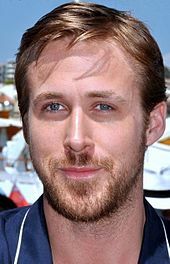 https://www.nytimes.com/2011/09/18/movies/ryan-gosling-and-ides-of-march.html?pagewanted=all 2012年1月26日閲覧. "At 19, with a stint as television’s “Young Hercules” behind him, he decided to focus on what he called “serious film,” only to be dropped by his agents. “It’s very hard coming from kids’ television to break the stigma,” he said." ^ Thomas, Kevin (2002年5月17日). “Believer Doesn't Tell the Whole Story”. Los Angeles Times. http://articles.latimes.com/2002/may/17/entertainment/et-thomas17 2012年1月26日閲覧. "In the title role, Ryan Gosling is electrifying and terrifyingly convincing, but key people around him are so inadequately drawn as to be unpersuasive." ^ McCarthy, Todd (2001年1月25日). “The Believer”. Variety. http://variety.com/2001/film/reviews/the-believer-1117797162/ 2017年6月11日閲覧. "But Gosling, who recently gained notice in “Remember the Titans,” could scarcely have been better as the rock-hard, mentally penetrating, well-spoken and impossibly conflicted Danny. It’s a dynamite performance in a unique, and uniquely troubling, role." ^ “Murder by Numbers Review”. Entertainment Weekly. (2002年4月17日). オリジナルの2017年4月11日時点によるアーカイブ。. https://web.archive.org/web/20170411132008/http://ew.com/article/2002/04/17/murder-numbers-2/ 2012年1月26日閲覧. ""The Believer"'s Ryan Gosling, a phenomenal talent even in junk like this"
^ McCarthy, Todd (2002年4月12日). “Murder By Numbers”. Variety. http://www.variety.com/review/VE1117917458?refcatid=31 2012年1月26日閲覧. "But as strong and charismatic as Pitt and Gosling are playing these upper-class California devils, they are let down by the screenplay by Tony Gayton (“The Salton Sea”), which doesn’t explore the nature of their dubious collaboration deeply or convincingly." ^ “Q/A: Ryan Gosling”. The Independent. オリジナルの2012年4月1日時点によるアーカイブ。. https://web.archive.org/web/20120401195738/http://www.independent-magazine.org/node/496 2012年1月26日閲覧. "I knew that working with David Morse was going to make me a better actor. And it did." ^ スティーヴン・ホールデン（英語版） (2002年3月29日). “On or Off the Field, Rough, Raw and Twangy”. The New York Times. https://movies.nytimes.com/movie/review?res=9F02E4D71E3BF93AA15750C0A9649C8B63&partner=Rotten%20Tomatoes 2012年1月26日閲覧. "Major star material, Mr. Gosling has a rawness and an intensity that recall the young Matt Dillon, although he is a very different physical type." ^ マノーラ・ダージス（英語版） (2003年1月24日). “'Slaughter Rule' Tosses Metaphors Like Passes”. Los Angeles Times. http://articles.latimes.com/2003/jan/24/entertainment/et-dargis24 2012年1月26日閲覧. "Between Gosling's raw talent and the magnificence of the film's wide-open country, it's easy to see why." ^ Ebert, Roger (2004年4月2日). “The United States of Leland”. Chicago Sun-Times. http://rogerebert.suntimes.com/apps/pbcs.dll/article?AID=/20040402/REVIEWS/404020302 2012年1月26日閲覧. "Ryan Gosling, a gifted actor, does everything that can be done with Leland, but the character comes from a writer's conceits, not from life." ^ Scott, A. O. (2004年4月2日). “A Tale of Crime and Consequences”. The New York Times. https://www.nytimes.com/2004/04/02/movies/02LELA.html?ex=1112418000&en=1075764f9fedd415&ei=5083&partner=Rotten%20Tomatoes 2012年1月26日閲覧. "Mr. Gosling, whose watchful, wounded intelligence and close-set eyes can remind you of a young Sean Penn, struggles to rescue Leland from the clutches of cliché, to keep him from becoming yet another disaffected child of affluence in the tradition of Holden Caulfield and Donnie Darko." ^ Rooney, David (2003年1月20日). “The United States of Leland”. Variety. http://www.variety.com/review/VE1117919715?refcatid=31 2012年1月26日閲覧. "Gosling’s one-note, blankly disturbed act has none of the magnetic edge of his breakthrough work in “The Believer,” while the intriguing ambiguity of Cheadle’s character could have been far more interestingly explored." ^ スティーヴン・ホールデン（英語版） (2012年1月26日). “When Love Is Madness and Life a Straitjacket”. The New York Times. https://movies.nytimes.com/movie/review?res=9E0DE5D91E39F936A15755C0A9629C8B63. "And against your better judgment, you root for the pair to beat the odds against them." ^ Thomson, Desson (2004年6月25日). “Young Love, Old Story”. The Washington Post. http://www.washingtonpost.com/wp-dyn/articles/A2293-2004Jun24.html 2012年1月26日閲覧. "But McAdams (who has already proved her mettle in "Mean Girls") brings her archetypal rich girl to resounding life; and Gosling imbues Noah with beguiling unaffectedness. It's hard not to like these two or begrudge them a great love together." ^ Dargis, Manohla (2005年10月21日). “Something Is Happening, But Who Knows What It Is?”. The New York Times. https://movies.nytimes.com/2005/10/21/movies/21stay.html 2012年1月26日閲覧. "The consummately talented Ms. Watts would be watchable even if she were reciting the tax code in Aramaic (which frankly sounds more entertaining than her last film, "The Ring Two"), while the same goes for Mr. Gosling, who, like his fans, deserves better." ^ McCarthy, Todd (2005年10月20日). “Stay – Film Reviews”. Variety. http://www.variety.com/review/VE1117928621?refcatid=31 2012年1月26日閲覧. "While the capable McGregor and Gosling deliver nothing new from what they’ve shown before, Watts is radiant and, in a small role, Elizabeth Reaser registers as an intriguing newcomer." ^ Turan, Kenneth (2006年8月25日). “Half Nelson' Has a Firm Grip on Life's Drama”. Los Angeles Times. http://articles.latimes.com/2006/aug/25/entertainment/et-nelson25 2012年1月2日閲覧. "It is a mesmerizing performance, casual yet dominating, and one that shows the kind of deep understanding of character few actors manage." ^ Stein, Ruthe (2011年6月24日). “The Kids Are All Right. As for the Teacher”. San Francisco Chronicle. http://www.sfgate.com/cgi-bin/article.cgi?f=/c/a/2006/08/25/DDGBAKNVBU1.DTL 2012年1月26日閲覧. "Nobody who cares about great acting will want to miss his performance -- even if you leave the movie more confused than enlightened." ^ Jim Emerson (2006年9月15日). “Half Nelson”. rogerebert.com (rogerebert.com). http://rogerebert.suntimes.com/apps/pbcs.dll/article?AID=/20060914/REVIEWS/609140302 2012年9月14日閲覧. ""Ryan Gosling" may sound like the name of a teen heartthrob, but this performance, coming after "The Believer," proves he's one of the finest actors working in contemporary movies." ^ Ebert, Roger (2007年10月18日). “Lars and the Real Girl”. Chicago Sun-Times. http://rogerebert.suntimes.com/apps/pbcs.dll/article?AID=/20071018/REVIEWS/710180304 2012年1月26日閲覧. "How do you make a film about a life-sized love doll, ordered through the Internet, into a life-affirming statement of hope? In "Lars and the Real Girl," you do it with faith in human nature, and with a performance by Ryan Gosling that says things that cannot be said." ^ Hornaday, Ann (2007年10月19日). “Lars and the Real Girl' Break a Wooden Heart”. The Washington Post. http://www.washingtonpost.com/wp-dyn/content/article/2007/10/18/AR2007101802350.html 2012年1月26日閲覧. "Gosling's performance as Lars is a small miracle, not only because he's completely, vulnerably open as a man who's essentially shut off, but because he changes and grows so imperceptibly before our eyes." ^ Dargis, Manohla (2007年10月12日). “Lars and the Real Girl”. The New York Times. https://movies.nytimes.com/2007/10/12/movies/12lars.html 2012年1月26日閲覧. "With the exception of a delicate moment when Lars sways in a darkened room, his eyes squeezed shut in private reverie, the performance is a rare miscalculation in a mostly brilliant career." ^ Puig, Claudia (2007年4月23日). “'Fracture' Puts It All Together”. USA Today. http://www.usatoday.com/life/movies/reviews/2007-04-19-fracture_N.htm 2012年1月26日閲覧. "Watching a veteran like Hopkins verbally joust with one of the best young actors in Hollywood is worth the price of admission." ^ Dargis, Manohla (2007年4月20日). “Fracture”. The New York Times. https://movies.nytimes.com/2007/04/20/movies/20frac.html 2012年1月26日閲覧. "The glib entertainment “Fracture” offers an assortment of tasty treats, notably the spectacle of that crafty scene stealer Anthony Hopkins mixing it up with that equally cunning screen nibbler Ryan Gosling. [中略] Each actor is playing a pulp type rather than a fully formed individual, but both fill in the blanks with an alchemical mix of professional and personal charisma." ^ Mueller, Matt (2008年3月14日). “Interview: Ryan Gosling”. London: The Guardian. https://www.theguardian.com/film/2008/mar/14/1. "Will the experience make him reassess how he approaches offers? "Yeah, I think so. It was nice to be believed in that much, but it was also an important realisation for me: not to let your ego get involved. It's OK to be too young for a role."" ^ LaSalle, Mick（英語版） (2011年6月27日). “Sad, but Among the Best”. San Francisco Chronicle. http://www.sfgate.com/cgi-bin/article.cgi?f=/c/a/2011/01/07/MVK31GPNCQ.DTL 2012年1月26日閲覧. "Gosling brings a preternatural understanding of people to his performance [後略]"
^ Scott, A. O. (2010年12月28日). “‘Blue Valentine’ Flits Through Couple’s Time”. The New York Times. https://movies.nytimes.com/2010/12/29/movies/29blue.html 2012年1月26日閲覧. "Mr. Gosling is convincing as the run-down, desperate, older Dean, and maybe a bit less so as the younger version, but in any case it is hard to intuit what connects one to the other." ^ Gleiberman, Owen (2011年1月6日). “Blue Valentine Review”. Entertainment Weekly. http://www.ew.com/ew/article/0,,20453723,00.html 2012年1月26日閲覧. "Gosling plays Dean as a snarky working-class hipster, but when his anger is unleashed, the performance turns powerful." ^ Morris, Wesley (2011年1月7日). “Blue Valentine”. The Boston Globe: p. 2. オリジナルの2012年5月27日時点によるアーカイブ。. https://web.archive.org/web/20120527222725/http://articles.boston.com/2011-01-07/ae/29339496_1_blue-valentine-williams-and-gosling-cindy/2 2012年1月26日閲覧. "Gosling steps right into the Cassavetes idea. He can be bluesy. But here that crypto-Queens drawl, the Methody deliberateness, the all-purpose angst, trendy accoutrements of handsomeness (mustache, biceps, expensive-looking shades) can also suggest membership in an all-barista Marlon Brando tribute band. There’s something of that in this performance — hipsterism misdirected." ^ a b Zeitchik, Steven (2010年12月26日). “Ryan Gosling Again Takes the Plunge in 'Blue Valentine'”. Los Angeles Times: p. 2. http://articles.latimes.com/2010/dec/26/entertainment/la-ca-ryan-gosling-20101226/2 2012年1月26日閲覧. "Asked if he's proud of the film, Gosling hesitates. "I'm proud of what Kirsten does in the movie," he says finally. (He later elaborates: "It was a hard film to make because it was such a dark experience. [後略]")"
^ LaSalle, Mick（英語版） (2011年6月27日). “Good Acting Isn't Enough”. San Francisco Chronicle. http://www.sfgate.com/cgi-bin/article.cgi?f=/c/a/2010/12/16/MVI41GPGMO.DTL 2012年1月26日閲覧. "Gosling is completely convincing as this empty shell of a man, and to his credit - as well as that of director Andrew Jarecki and screenwriters Marcus Hinchley and Marc Smerling - he grabs our emotions: He makes us hate the sight of him"
^ Sharkey, Betsy (2010年12月10日). “Movie review: 'All Good Things'”. Los Angeles Times. http://articles.latimes.com/2010/dec/10/entertainment/la-et-all-good-things-20101210 2012年1月26日閲覧. "But back to the good thing about "All Good Things" — that would be Kirsten Dunst, for if there is one thing this strange and creepy film does well it is remind us of just what a talented actress she is. Gosling is good too, but Dunst is "all good," beautifully nuanced as a young woman whose hopeful dreams turn dark and deadly." ^ Hornaday, Ann (2011年7月29日). “Critic Review for Crazy, Stupid, Love”. The Washington Post. オリジナルの2015年12月10日時点によるアーカイブ。. https://web.archive.org/web/20151210232439/http://www.washingtonpost.com/gog/movies/crazy-stupid-love,1167442.html 2012年1月26日閲覧. "It would be dishonest to say there's no humor or outright pleasure to be had in "Crazy, Stupid, Love," especially at the hands of Gosling, whose seductive command presence suggests we may have found our next George Clooney." ^ Puig, Claudia (2011年8月3日). “'Crazy, Stupid, Love': Not, Quite, There”. USA Today. http://www.usatoday.com/life/movies/reviews/2011-07-27-crazy-stupid-love_n.htm?csp=34life&utm_source=feedburner&utm_medium=feed&utm_campaign=Feed%3A+UsatodaycomMovies-TopStories+%28Life+-+Movies+-+Top+Stories%29 2012年1月26日閲覧. "Most surprising is Gosling, who reveals a knack for comedy." ^ “Drive”. rogerebert.com. (2011年9月14日). http://www.rogerebert.com/reviews/drive-2011 2012年1月26日閲覧. "Ryan Gosling is a charismatic actor, as Steve McQueen was. He embodies presence and sincerity. Ever since his chilling young Jewish neo-Nazi in "The Believer" (2001), he has shown a gift for finding arresting, powerful characters." ^ Turan, Kenneth (2011年10月7日). “Movie review: 'The Ides of March'”. Los Angeles Times. http://www.latimes.com/entertainment/news/la-et-ides-of-march-20111007,0,4545006.story 2012年1月26日閲覧. "It's certainly involving to see the charismatic Gosling verbally spar with superb character actors like Hoffman and Giamatti." ^ LaSalle, Mick（英語版） (2011年10月31日). “'The Ides of March' review: The political animals”. San Francisco Chronicle. http://www.sfgate.com/cgi-bin/article.cgi?f=/c/a/2011/10/07/DDC01LDC7L.DTL 2012年1月26日閲覧. "But there is one aspect to the character that Gosling can't quite nail down, that might simply be outside his sphere, which is idealism." ^ Scott, A.O. (2013年1月10日). “These Law Enforcers Will Stop at Nothing”. ニューヨーク・タイムズ. https://movies.nytimes.com/2013/01/11/movies/gangster-squad-with-sean-penn-ryan-gosling-and-emma-stone.html 2013年8月31日閲覧. "And also, apparently, to give a cast of first-rate actors the chance to earn some money trying out funny voices and suppressing whatever sense of nuance they might possess." ^ Sharkey, Betsy (2010年1月10日). “Review: 'Gangster Squad' runs through its ammo to no avail”. ロサンゼルス・タイムズ. http://articles.latimes.com/2013/jan/10/entertainment/la-et-mn-gangster-squad-review-20130111 2017年5月3日閲覧. "She[=Stone] and Gosling give the growing connection between Grace and the good guy a seductive power. But like too much else in the film, it's a scenario that is only half played out." ^ Scott, A.O. (2013年3月28日). “Good Intentions, Paving the Usual”. The New York Times. https://movies.nytimes.com/2013/03/29/movies/the-place-beyond-the-pines-directed-by-derek-cianfrance.html 2013年8月31日閲覧. "Mr. Gosling’s cool self-possession — the only thing he was allowed to display in “Drive” — is complicated, made interesting, by hints of childlike innocence and vulnerability." ^ Debruge, Peter (2013年5月22日). “‘Only God Forgives’ Review: Ryan Gosling Even More Inscrutable in "Drive" Reunion”. Variety. http://variety.com/2013/film/reviews/cannes-film-review-only-god-forgives-1200486200/ 2013年7月25日閲覧. "The wallpaper emotes more than Ryan Gosling does in “Only God Forgives,” an exercise in supreme style and minimal substance from “Drive” director Nicolas Winding Refn." ^ Holden, Stephen (2013年7月18日). “Mom Is a Drug Lord, and Gore Is a Narcotic”. The New York Times. https://movies.nytimes.com/2013/07/19/movies/in-only-god-forgives-a-mother-is-bent-on-revenge.html 2013年8月31日閲覧. "Unable to give his automaton any suggestion of an inner life, Mr. Gosling moves through “Only God Forgives” as if in a slow-motion trance." ^ Sharkey, Betsy (2013年7月18日). “Movie review: 'Only God Forgives' needs to be saved from itself”. ロサンゼルス・タイムズ. http://www.latimes.com/entertainment/movies/moviesnow/la-et-mn-only-god-forgives-review-20130719,0,7368456.story 2013年7月25日閲覧. "Gosling, so effective and affecting as the nearly silent stunt driver, has never been less dimensional than he is as Julian, a fugitive gangster managing his drug trade out of a Bangkok boxing club. [中略] Gosling moves through "Only God Forgives" like a mannequin waiting to be brought to life." ^ Stewart, Sara (2013年7月18日). “‘Only God Forgives’ movie review”. New York Post. http://nypost.com/2013/07/19/blood-flows-very-slowly-in-only-god-forgives/ 2013年7月25日閲覧. "Why the long face, Ryan Gosling? I get that you want to distance yourself from the cheeseball stigma of “The Notebook,” but enough already. [中略] There’s almost zero levity to be had in “Only God Forgives,” from “Drive” director Nicolas Winding Refn, in which Gosling reprises his man-of-few-words persona." ^ Chang, Justin (2014年5月20日). “‘Lost River’ Review: Ryan Gosling’s Howler of a Directing Debut - Variety”. Variety. http://variety.com/2014/film/reviews/cannes-film-review-ryan-goslings-lost-river-1201187183/. "It’s perversely admirable to the extent that Gosling has certainly put himself out there, sans shame or apology, but train-wreck fascination will go only so far to turn this misguided passion project into an item of even remote commercial interest." ^ Bradshaw, Peter (2017年1月12日). “La La Land review – Gosling and Stone sparkle in a gorgeous musical romance”. ガーディアン. https://www.theguardian.com/film/2017/jan/12/la-la-land-review-ryan-gosling-emma-stone-musical-romance-movie 2017年5月4日閲覧. "He is tough and sardonic, with a way of trying to conceal how hurt he is – or how in love he is. Like Stone, he is not a natural singer, yet there is something very real and human in the way they handle the songs."